Berlin is awash with history and heritage listed buildings. Despite the devastating damage suffered towards the end of World War Two Berlin has managed to preserve and many of its architectural wonders. My Destination Berlin features information on many buildings of historical interest throughout Berlin from grand Prussian buildings to more recent Soviet era monuments. Many historical buildings are concentrated in Mitte, including the Berlin Cathedral, Rotes Rathaus (Red Town Hall), the German and the French Cathedral on Gendarmenmarkt, the Reichstaggebäude (German Parliament Building) and of course the Brandenburger Tor. 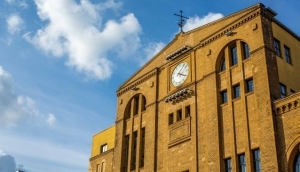 With a mixture of parties, theatre, bars, billiard hall, cinema, live music, beer gardens and markets, the Kulturbrauerei is one of the cultural hubs of Prenzlauer Berg..